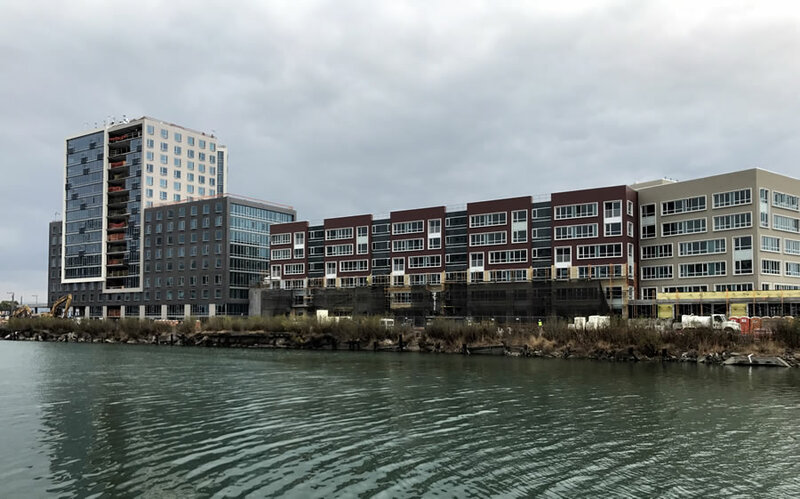 The 16,600 square feet of commercial space under construction at the base of One Mission Bay has been divided into five individual units and two of the five spaces have been leased. A gym to be known as “Zone 415” has leased the smallest space (1,700 square feet) in the ‘Park’ building at the corner of Fourth and Channel Streets. And the operators of the Ferry Plaza Wine Bar have signed a ten-year lease for the largest space in the building and plan to open a sister concept in the 3,629-square-foot space fronting Mission Creek and its park. At the same time, while the development team is still looking for a “world-class flagship restaurant or retailer” to fill the development’s signature 6,400-square-foot space at the base of its ‘Tower’ building, across from The Yard at the corner of Third, they’ve also engaged a broker to find a buyer for the spaces, which are technically two commercial condos, in part or whole. Want to Buy a Weed Shop in San Francisco? Mission Creek, is that it’s official name now, is a beautiful resource. I wish it could have been extended somehow. A la the old Pei proposal. That said, this building is a monstrosity – what could have been. But no, a massive housing block. 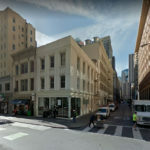 As to trying to sell the commercial spaces with a broker, I assume they are assuming it’s going to take a while to lease them out and the key – with developers – is to get out as soon as possible. It’s no Nyhavn but at least it’s addressing the water. Even better would be if the China Basin building across the creek had commercial activity on its waterfront terraces. The park along the Creek is appreciated. I’m not big on balconies in SF but, if they should have been used anywhere, it is here. The “tower” has some weird balcony thing going on but clearly this project was not thought out. I mean, I think all of our imaginations could run wild with brilliant proposals that far exceed the reality of this parcel, but it’s not how development or design works. In terms of using a broker; that’s neither odd nor daft. No one wants a building to sit vacant—stakeholders, tenants, or the public. It’s not as if every new building should be brilliant. It’s like can SF have just a few such. In special areas like this or TI which will be an architectural disaster – as well as a transportation and usage disaster. Most cities value their “special places” while SF does not. Look at what Chicago is doing on the Lake and then look at what SF is doing on TI. Or here – Inexcusable. Sure. I totally agree that SF’s planning dep is mostly asleep at the wheel (or at a min, good at dragging their feet) but not sure it warrants pointing fingers at architects (not that you nec are), or in some cases, well-intentioned developers. I think what makes CHI seem so successful in comparison, is the century old legacy and culture that respects architecture and urban planning—something SF has struggled with acheiving one generation after the next. How San Francisco gets there without breaking some eggs is hard to say. “Mission Creek” has been its name since the early 1800s… because it used to go all the way to … wait for it … the Mission. What’s left is just a little sad remnant of a creek / estuary system that would have been a lot like that at the top of Richardson Bay, where 101 arcs past Tam Junction. Now that this construction is wrapping up, can we expect groundbreaking to finally happen on the long-proposed hotel to fill the remainder of the block? SF should have an initiative ‘keep the waterfront boring’. Mission Creek is a total lost opportunity. The creekfront is always dead quiet at all hours thanks to SF zoning where they ensured the ground-level is all private residences. Because there is such a demand for retail space that every development that includes such space leases up immediately. How many $5.00 latte coffee shops does the neighborhood need? I took a picture of a pile — a huge pile — of needles that a tourist’s child stepped on getting out of their rental. They raced off to SF General and I phoned it in to 311. It was cleaned up two days later, maybe. You know — 311. Multiple reports have been published noting as fact that rampant over development in San Francisco has chased all the riffraff out of their shooting galleries and into our tent camps. But nowhere, ever, do I see a peep from the “boosters” about the idea of a 360 degree approach to developing our city in a way that doesn’t ruin life here for some, so that a few out of town developers and their local minions can profit. I am trying to understand your post – yes, needles in the street is horrible. Are you saying that the street people are caused by developments like this one, and it was better if people would be shooting up in an abandoned warehouse? Well keep trying. If there’s hope for Trump (says Pelosi) there’s hope for you. Maybe this will help: when Catellus (simply the real estate development arm of Southern Pacific RR) finally got approvals to site prep for ALL OF MISSION BAY, they brought in the Pinkerton’s just like during the railroad robberies 100 years before, this time to clear out Mission Bay. Not a single soul at SFGov, SFPD, PlannINC, etc. made even the slightest effort to even identify much less address what that huge displacement would mean to surrounding neighborhoods. So surrounding neighborhoods suddenly experienced an in-migration of the worst of the worst from the no-mans-land of Mission Bay into SOMA and the east Mission. This happens constantly in the city. 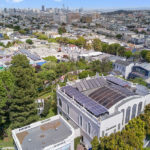 It should be a formal part of the development process — mitigation of impacts on adjacent neighbors in the case of small projects, and neighborhoods in the case of large ones. We aren’t Houston — though it seems half of the developers currently down-building our once beautiful city with ugly me-too buildings are. While I appreciate that any president elected my the US populous should be given the benefit of a doubt, I do not appreciate being compared to Trump or Pelosi, and I shall refrain from bashing either on this site. So your complaint with this project is the lack of mitigating action for the persons displaced, and not the look of the development that others were complaining about? Or are you against the redevelopment of dilapidated warehouses all together? While I favor the redevelopment of unused properties, I agree that there should be mitigating actions, but am not sure if it should extend to squatters. But you are right that they don’t disappear just because they are evicted – the problem of homelessness prevails and should be dealt with, regardless of redevelopments. Heh. Had to read that twice. The gym is 1700 feet, but the wine bar is ~3700? OK.
It’s more of a pilates fitness studio. Probably mostly personal training. It’s not your conventional Gold’s Gym with weights and treadmills. This new development is depressing, there is nothing about this property that would make me interested to come and check it out. I think that is a big loss for the businesses that are going to move in. It’s a dark corner of Mission Bay that has nothing interesting about it. A big opportunity to make something interesting, appealing that would entice individuals to walk there, check it out and spend a couple of bucks. But instead, they missed the ball completely. This area of San Francisco get’s lots of sun in comparison from the west and north. It’s sad that they decided to put more walls than windows to enjoy the sunlight. I don’t understand, but his property is a drab, it’s a “wannabe” concrete slab. I agree with you. This creek would be a vibrant urban ‘riverwalk’ in any other city (think Portland, London, Chicago, many european cities). But thanks to SF zoning, it’s mostly quiet, residential. Totally empty and sterile as soon as the sun comes down. This is SF’s definition of a ‘public waterfront’. Make it quiet and and dormant as possible other than people jogging or walking their dogs. They should have made it 50% retail, 50% parks with an emphasis on beautiful european style architecture. Nope! Instead they let people build boring, clunky, boxy crap. Donjuan, I agree with you, it is boxy crap. European style architecture is not viable for SF with its ever increasing need for housing.